A Michigan resident and reporter hopes places like Milwaukee learn from the public health crisis that befell Flint more than four years ago. A Michigan resident and reporter hopes places like Milwaukee learn from the public health crisis that befell Flint more than four years ago. WUWM's Susan Bence reports. Detroit-based journalist Anna Clark's recently-published book The Poisoned City: Flint’s Water and the American Urban Tragedy is a a deep dive into the public health crisis that continues to reverberate in Flint, Mich.
Clark was in Milwaukee Wednesday talking about her research at Marquette University. She hopes other communities can avoid the tragedy that struck Flint where children's health had already been permanently impacted before the city took action. "As in Flint, it’s children’s bodies that are the metric. In other words these kids have to get sick before anybody is going to do something about it. That’s not good enough. I think we as a society can do better than that," Clark says. She says Flint and Milwaukee have lots in common, including being midsized Great Lakes cities. 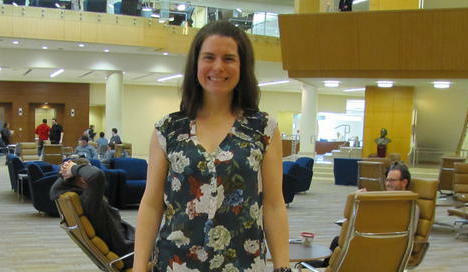 Detroit-based journalist Anna Clark spoke at Marquette University on Wednesday. "They are blessed being in a region that has some of the most abundant freshwater resources on the face of the earth. They have been shaped both economically and culturally by their industrial past," Clark says. In addition, both Milwaukee and Flint are highly segregated. Clark says segregation is a root cause and part of the pattern that has led to infrastructure inequality in America. Yet, when it comes to tackling its lead challenge, Clark says Milwaukee surpasses other cities in some ways because "there is pretty much unanimous acknowledgement that lead is in fact a problem. That's more than most people are doing, even in the wake of Flint." But Clark says dissent among groups advocating for action in Milwaukee — some who feel lead paint must be removed in the environment, others who feel lead in water is most critical — risk diminishing their impact, if they cannot find ways to synchronize their efforts.
" ... These kids have to get sick before anybody is going to do something about it. That's not good enough. I think we as a society can do better than that." WUWM's Susan Bence speaks with journalist Anna Clark in an extended interview for Lake Effect. "Some folks I talked with while working on the book have thought about if you have to step into someone's home to hook up a new non-lead pipe, what if that's also an opportunity to do an audit of other sources off lead in the house ... What if it's one common effort," Clark says. She hopes cities find ways to scale up efforts to eliminate the toxic material "because one thing we've learned with both racism and lead is that it doesn't go away by just pretending it's not there," Clark says. More of my conversation with Anna Clark will air Monday, Jan. 28 during Lake Effect at 10 a.m. and 10 p.m.
What started as conversations five years ago evolved into Milwaukee Water Commons. While science and business opportunities were important in those initial discussions, the group wanted to broaden their reach to get the entire community involved in protecting a common resource — water.